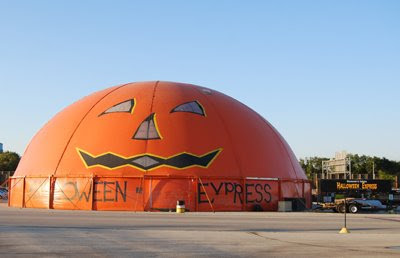 This giant pumpkin in the parking lot at the Pettit Center is a store for Halloween Express. The pumpkin went up around the middle of September, and will be around until a week or so after Halloween. They sell costumes, wigs, makeup, accessories, and just about anything else you need for your end-of-October parties. That is pretty cool! Our town is too small for something like that, but it would be great to shop there! I love it. It must be very exciting for children to go there!